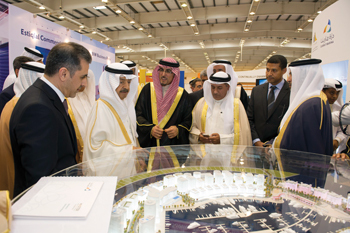 The Premier at last year’s Gulf Property Show. THE trio of exhibitions – gulfBID, gulfInteriors and the Gulf Property Show – set to open this month (May 12 to 14) in Bahrain has drawn a larger international presence this year, according to the organiser. Close to 4,500 sq m of space has already been booked for the three events, according to Hilal Conferences and Exhibitions (HCE). the event’s organiser. Of this, some 700 sq m of space has been booked by three countries alone. Turkey has taken up 200 sq m of exhibition space, with GCC countries the UAE and Saudi Arabia each occupying 250 sq m of space at the Bahrain International Exhibition and Convention Centre. Popularly called the ‘3Gs’, the annual shows are the biggest integrated business-to-business platforms for the construction, interior and property sectors in the Northern Gulf and will take place under the patronage of Bahrain’s Prime Minister HRH Prince Khalifa bin Salman Al Khalifa. The Gulf Property Show will lead the way among real estate exhibitions, by being the first event of its kind in the world to feature a property search engine on its website. This will enable visitors to view listed properties from exhibitors which are available for sale prior to the exhibition, and to contact the sales agents accordingly. Exhibitors have welcomed this initiative, said the organiser. “The property search engine is a welcome initiative as it means that as an exhibitor it enables us to market our wider portfolio, which space at the exhibition may not allow us to. We have been involved with the Gulf Property Show since its inception and are impressed by its innate understanding of business development for the property sector,” said Aziz Mithaiwala, managing director of Arabian Property Awards winner Pegasus Realty. Gulf Property Show 2015 is marking a milestone year in its development as the region’s boutique property show, the organiser said, adding that it has attracted interest from realtors selling properties in the GCC, Bahrain, Turkey, Bosnia, Bulgaria, UK, with interest from Cyprus and Spain. “The property search feature will be added to an online virtual exhibition for a further 200 days after the exhibition ends, which provides exhibitors with a wider marketing appeal and also the opportunity to close deals before and after the show from clients who may not be able to visit the exhibition,” said Ahmed Suleiman, exhibition director of the Gulf Property Show. The show has garnered support from the Bahrain Property Developers Association (BaPDA), the Middle East Facilities Management Association and the German Chambers of Commerce. BaPDA said it is committed to the promotion of Bahrain’s real estate industry as a major economic sector for the kingdom. “The Gulf Property Show plays an important role in promoting Bahrain’s real estate sector not just within the country but across the wider GCC and internationally,” said BaPDA chairman Aaref Hejres. Meanwhile, this year’s edition of gulfBID, a market leading specialist exhibition for the Northern Gulf’s construction and building materials sector, will have a strong representation of companies from Saudi Arabia including Al Koblan Thermopipe, Al Rezayat Protective Coating, Gulf Scaffolding Company, Al Dweik Factory, Plastbau Arabia Company, Concrete Technology, Riyadh Crane Technology, Shade Technology and Bonar Natpet. “The business value of gulfBID is seen through the strategic sponsorship given to the event by Haji Hassan Group and KMC Holdings,” remarked Jubran Abdulrahman, managing director of HCE. Bahrain’s Haji Hassan Group covers 13 sectors that specialise in the manufacturing of construction materials, road infrastructure, bridges and flyovers projects and real estate development; while Bahrain-based KMC Holdings provides total solution packages from KMC’s various divisions for the construction sector. Meanwhile, gulfInteriors will be dedicated to connecting the GCC’s architects, designers, real estate developers, manufacturers, distributors, dealers and investors. The event provides a platform for the interior design industry to display their products and services to the public and to potential customers exhibiting at the gulfBID and Gulf Property shows.